The fantasy framed by departure and return to normality may work in any of these ways. What is consistent, however, is that the fantasy works upon the child who experiences it, and whether they derive growth, understanding, moral awareness or a safety-valve for antisocial desires from the experience, the return is made to a reality that has remained unchanged. In this sense, whether the fantasy journey endorses behaviour that is anarchic or desires which are unsanctioned by society, or puts the protagonist through challenges designed to socialise in the “real” world, the child returning must remain in a reality which is fixed. They may choose to adapt or not, but the world in which they belong will not adapt to fit their transformative experiences. U. C. Knoeflmacher(2) notes that the “decorous and lady-like women who dominated the field of Victorian children’s literature” express something of a paradox in their writing, since “the mode of fantasy also freed the same aggressive impulses that their fictions ostensibly tried to domesticate”. He argues that writing fantasy, for women such as Mrs Molesworth, whose texts The Cuckoo Clock and The Tapestry Room this essay will discuss, was a way to “turn their own satiric energies against the deficiencies or complacencies of a society that frowned on female anger” while outwardly functioning as narratives of socialisation. actually amplifies the impossibility of achieving this, not merely through the very fact of the return, in which the “real world” has the “last word,” as it were, but because, as I will show, the fantasy cannot occur in a space entirely free from adult intervention. Just as the adult is constantly and unshakeably present in the language, so the idea of an adult presence is constantly present in the narrative, in the form of a guide or mentor figure. The presence of the adult in the return fantasy sets limits upon to what extent the child can have a truly anarchic and unrestricted experience, since the adult guide constantly explains, limits and instructs how to proceed in worlds that appear initially lawless. 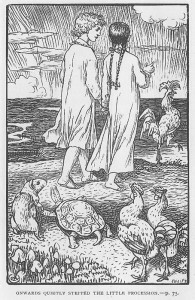 Viewed in this way, the return journey into fantasy becomes a cyclical gesture of the sort that other Victorian children’s fantasy narratives (for example, At the Back of the North Wind, The Water Babies and the Alice texts) practise in language. Instead of being worked out at the linguistic level however, the return is made part of a narrative, and enacts at the level of plot this reaching towards an idea of the child. The return journey, in other words, is an attempt to grasp or articulate this “child” through first setting up a representation of the real world, with the associated known social structures, and then striking out from that representation of the real into a representation of fantasy land, which may be governed by rules of its own, but which seems a strange and lawless place. It is in the wild and unsocialised spaces of fantasy that the child’s inner life might be explored, and the idea of what a child might do if free from adult rules pondered. opposite. The child is accompanied by adult figures, and while they may be helpful or downright useless, they still signal that it is impossible to imagine a child without a mediating adult. The return is a retreat, an admission that narrative fails just as language does to say what the child really is, that it will always be understood through the eyes and the idea of the adult. In delivering the child safely back to the reality from where it was taken, the return proposes that there is no child who can be successfully articulated other than as a socialised being, something understood through the adult culture that it inhabits and which shapes it. 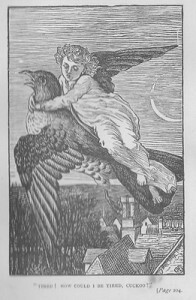 The narrator posits that change must occur, for time passes and rooks are not immortal, yet that italicised “suppose” suggests that although the narrator is aware that both the passage of time and the birth and death of rooks are things that “must be so,” the evidence of appearances, that the rooks were “ever and always the same” is almost more convincing. A little girl in a grey merino frock…all grey together, even to her eyes, all except her round rosy face and bright brown hair. Her name even was rather grey, for it was Griselda. Her potential for change, signified by her rosy face and bright hair, markers of her youth, is limited by her strong association with the colour grey, with its connotations of old age. Griselda is linked to the past not only by this, but through the memories of the three old ladies, the “aunts” (who were really the much older cousins of her grandmother) and the old servant Dorcas. “We are all old here, missie. ‘Twas time something young came to the old house again,” Dorcas tells Griselda, suggesting that although she is “something young,” she is not something new: that “again” points to a repetitive history of which Griselda is an unwitting part. Later Aunt Grizzel tells Griselda that she is the third generation of young children entrusted to the aunts’ care, following her grandmother and her father. This insistence on permanence and repetition is even echoed in the speech of the two aunts; Aunt Tabitha, the quiet, passive sister, almost never speaks for herself, instead acting as an echo for her more confident and decisive sister. “It was rather a bother to have to always say ‘thank you’ or ‘no, thank you’ twice, but Griselda thought it was polite to do so, as Aunt Tabitha always repeated everything that Aunt Grizzel said”. The constant refrain of the aunts is how much she resembles her long-dead grandmother Sybilla: “The aunts looked at each other with a little smile. “‘So like her grandmother,’ they whispered”. This resemblance becomes all the stronger when we learn that Griselda, like her grandmother, has a fascination with the cuckoo clock in the drawing room. Her eventual discovery of the magical cuckoo who lives inside it and their subsequent adventures together, it is strongly suggested, is a secret that Sybilla also knew of. 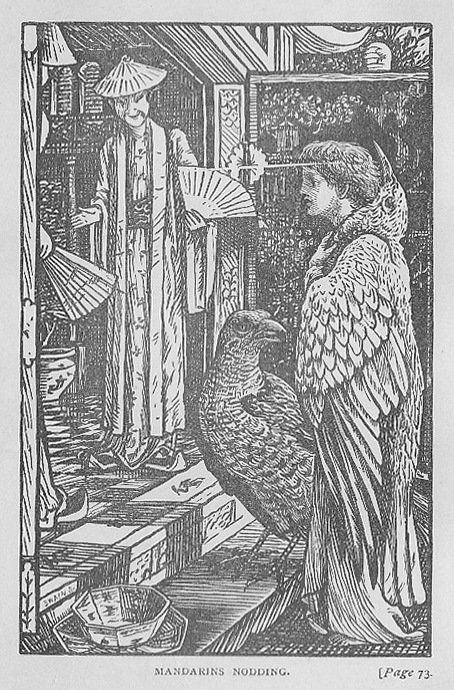 “Just what Sybilla used to say,” whispers Aunt Grizzel, when Griselda insists that the cuckoo is alive. 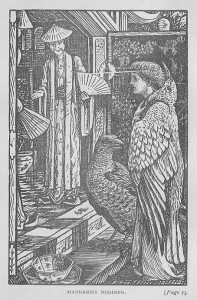 Later the cuckoo reveals to Griselda, in a dream sequence of moving images, that Sybilla was sent from Germany to live with the great aunts in England, and that the cuckoo clock was made by her grandfather and gifted to her when she came to England. “Griselda” is of course not only a “rather grey” name, it is also a German name, and “Grizzel” is the anglicised form of the name. Through their repetition of not only how much she resembles her, but of their hopes that she may turn out “as good as dear Sybilla, if not as beautiful – that we could hardly hope for,” Griselda is manipulated by her great aunts into a reincarnation of Sybilla, curtailing the possibility of any difference or of an existence in her own right. The change that “came at last” is not so much of a change, it seems, as the beginning of another cycle in a history that is prescribed, and Griselda’s status as both a change and an unchangeable “version” anticipates the cyclical structure of the narrative. The cuckoo himself, while for Griselda an agent of change and magic and entertainment, is actually, says Dorcas, the good luck charm that keeps the house safe and happy in an unchanging state. When the cuckoo clock stops after Griselda hurls a book at it, in a rage at her arithmetic sums, this portends for the great aunts not just bad luck, but the cessation of any kind of future. Aunt Grizzel, in great distress, cries: “What can be going to happen? The cuckoo clock has stopped”. Without the cuckoo clock, they have no concept of future; or to put it more accurately, the idea of a future, of change, is unthinkable to them because the cuckoo is constant, and represents complete, unchanging continuity. It has been in the house since Sybilla’s arrival began the cycle of extreme youth managed by age, and without it, it is suggested, this safe and happy status is threatened. That it is the cuckoo clock which is the key to the unchanging nature of the house and its inhabitants raises a problem if one of the functions of the return is to be understood as an escape or departure from the restricting norms of the socialised sphere which is inevitably an adult-constructed world. Griselda’s fantasies are entirely orchestrated by the cuckoo, who is a very definite “adult” figure, and who consistently engages her in catechistical dialogue, albeit not always successfully. Although he takes cues from her daytime activities, for example, her admiration of the carved “Nodding Mandarins” in the drawing room, the cuckoo retains absolute control over what she experiences, acting as a guide and protector, but also as the mediator of her experiences. Griselda is not allowed any role in transporting herself, either during the daytime or at night, to the scene of fantasy. There are no portals, such as the rabbit hole, and unlike Alice, she does not have to figure out the rules herself, as the cuckoo is a thoroughly reliable guide. She has no space to act as a quasi-adult within: even her brief walks outside on the terrace occur only on the occasion of auntly permission. time for her to return, she is never allowed to see the way back, but is always put to sleep in some way, so that she knows “nothing more till she open[s] her eyes the next morning,” to wonder “I believe the cuckoo made me fall asleep on purpose to make me fancy it was a dream. Was it a dream?”. The return functions as a curtailing of experience, but to what extent does the fantasy itself act as a controlling agent? Her adventures appear to allow her to play out some potentially dangerous fantasies; dangerous that is, in their “adult” and experiential implications. She attends a ball where she dances with the Emperor of China. Like Alice at the Mad Hatter’s tea party, Griselda is allowed to participate in a surreal parody of an adult ritual: here her Mandarin suitor and his courtiers are life-size nodding dolls who cannot speak. She also has, like Alice, experiences of a more profoundly fantastical nature: she is taken to the garden where all the world’s butterflies paint all the world’s flowers; she visits the lake on the Moon and looks back at the Earth. As Sarah Gilead notes, the return may condone such unsettling experiences by “officially resolving and fixing meanings” once safely back in a “real” setting, but it becomes evident when considering how Griselda’s adventures occur that even within the fantasy setting the balance of power lies with the adult figure of the cuckoo. The cuckoo not only hides from Griselda exactly how he transports her, he also selects her adventures and accompanies her, guiding and advising at all stages so that she is neither terrified at the distance between the Earth and the “other side” of the moon, nor does she inadvertently give offence to the King and Queen of the butterflies. So just as the repetitive history of which Griselda becomes a part works to thwart change, ensuring that she is transfixed in her role, so the cuckoo’s presence acts to preserve her as a child under the supervision of an adult. No matter how potentially dangerous and profoundly strange and otherwordly her adventures, she undertakes them as a child who is understood through her relationship with the cuckoo who acts both as chaperone and pedagogue, and the series of fantasies is framed as a series of lessons. Indeed, the cuckoo’s refrain, “you have a very great deal to learn,” and Griselda’s initial reluctance to learn the lesson of obedience, points to a narrative which is overtly concerned with the importance of preparing a child for subjugation beneath adult rule. It is not until Griselda has internalised this lesson, realised that “it’s all ‘obeying orders’ together” which matters and submitted dutifully to the strictures of the aunts that she is rewarded with the official sanctioning of her new daytime playmate, Phil. The narrative is resolved with the two children established as friends and the cuckoo, obligingly realising he is not needed any more, bidding Griselda farewell in a “real” dream: “merely a dream, nothing else”. Griselda’s very obvious lack of agency bears similarities to the experiences of children in two other “return” fantasies. Alice’s adventures and those of the two cousins who find their way into Tapestry Land in another of Mrs Molesworth’s children’s fantasies, The Tapestry Room, are both conducted under the supervision of adult eyes. While the cousins Hugh and Jeannie appear to negotiate their own way to a greater extent than Griselda, who is instructed by the very adult-sounding cuckoo at every turn where to go and also how to behave, they are still guided by their own “adult” bird, the mysterious and rather frightening raven Dudu. Dudu does not accompany them as the cuckoo does Griselda, but he has complete control over Tapestry Land, and the final say in what happens there and who is allowed entry. Given that Dudu is a French raven, it is tempting to suggest that his name is a sort of “childspeak” play on the French word for “God,” “Dieu.”2 Certainly Dudu has a godlike omnipresence and omniscience in Tapestry Land. He describes himself to Hugh as merely the “guardian” of the entrance, but also instructs him to whistle three times should he require assistance. 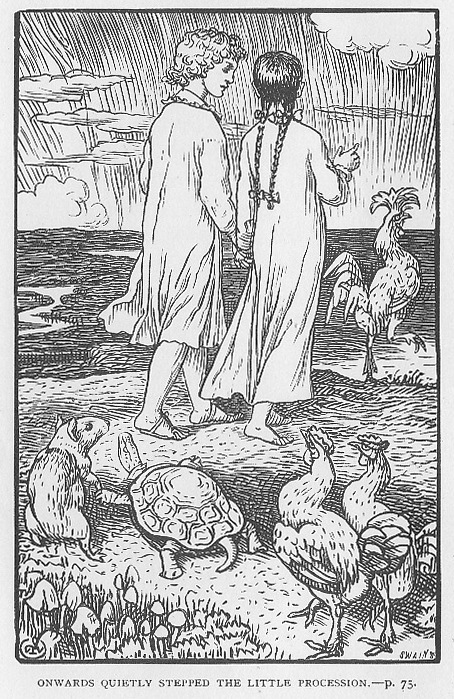 When a boat the cousins are attempting to navigate up a river runs aground and Hugh whistles, it is not Dudu himself who appears, but a fleet of frogs. Dudu is apparently able to control events in Tapestry Land from some unknown and unseen position. Alice too encounters adult figures and guides in Wonderland. 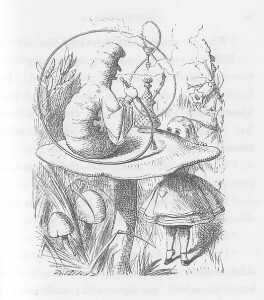 The advice they give may be meaningless or unhelpful (the Caterpillar’s direction to eat one side of the mushroom to grow taller and one to grow shorter without indicating which is which almost results in Alice’s annihilation), but they are adult ciphers, and behave in ways which Alice instinctively recognises: “‘How the creatures order one about, and make one repeat lessons!’ thought Alice. ‘I might as well be at school at once’” (Wonderland). Griselda experiences a similar attitude from Cuckoo: when she tries to point out a logical inconsistency in his argument, he cuts her off with an adult evasion tactic Alice would have found familiar. “‘Nonsense,’ said the cuckoo hastily; ‘you’ve a great deal to learn, and one thing is, not to argue’”. Dudu, while never a subject of the text’s covert mockery in the way that the cuckoo and Alice’s guides are, occasionally engages in patronising adult snarkiness. When Hugh tells him he would like to throw a party in the tapestry room castle, “‘only,’ observed the raven, drily, ‘there is one little objection to that. Generally – I may be mistaken of course, my notions are very old-fashioned, I daresay – but generally, people give parties in their own houses, don’t they?’”. Dudu, as Jeanne recognises, is rather too frightening a character for mockery. His inscrutable gaze and apparent ability to hear everything said makes him seem a “wicked enchanter”: she tells Hugh that it’s best to be “most frightfully polite” to him, and even her father addresses him as “Monsieur Dudu” with no trace of irony. 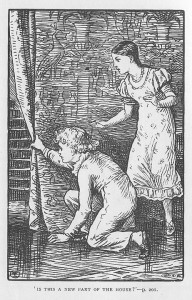 While the narrator of The Cuckoo Clock occasionally delights in pointing out where the cuckoo tries to hide mistakes behind an adult authority, Dudu is above such treatment. When he puts Hugh down, Hugh and the narrator assume a wounded but fearful silence. While the cuckoo mimics an authoritative but foolish adultness, Dudu represents a sterner adult authority, one that is not necessarily “fair” but maddeningly right. The cuckoo and Dudu are therefore both parodies or versions of adult behaviour, and their presence as guides of greater or lesser degrees of usefulness points to the impossibility of creating a space from which adults are actually outlawed. In both The Cuckoo Clock and The Tapestry Room the fantasy setting in which the children find themselves seems to have an intended function, however this might be ultimately thwarted by adult presence, of allowing a form of manageable experience which is not (and should not be, these texts imply) available to the children in their daytime lives. Both fantasies are ones to which the children may return, but only at night, and The Tapestry Room in particular makes it explicitly clear that the two states must be kept separate. When Jeanne and Hugh meet on the morning following their first foray into Tapestry Land, Hugh is upset to discover that although he can remember the night’s events clearly, Jeanne appears to have no recollection of what happened. It becomes clear that Jeanne’s apparent forgetfulness is, in fact, the “correct” and safe way to deal with these adventures. Marcelline, Jeanne’s mysterious nanny who seems well aware of the powers of Dudu and the tapestry room, explains to Hugh that there is “two of everything…and the great thing is to keep each of the twos in its right place” (The Tapestry Room). In a subsequent fantasy, Hugh is relieved to find that Jeannie does remember, but when he points this out to her she explains, “‘You don’t understand, Cheri. I’m moonlight Jeanne, now – when we were having the dolls’ feast I was daylight Jeanne. And you know it’s never moonlight in the day-time….I don’t exactly forget,’ said Jeanne, ‘but it spoils things to mix them together’”. Dorcas considers, “Then he must be quite a little boy, perhaps Miss Grizzel would not object so much in that case”. As a very little boy, Phil is harmless, but as someone her own age, he poses a potential sexual threat to Griselda. When Griselda announces this new friendship to the aunts, declares her intent of maintaining it and flies off in a temper when it is forbidden, Aunt Grizzel is swift to attribute blame. “‘Already,’ she said faintly. ‘She was never so violent before. Can one afternoon’s companionship with rudeness have already contaminated her?’”.It falls to the cuckoo, as usual, to provide an explanation, which he does in the form of the dream sequence. 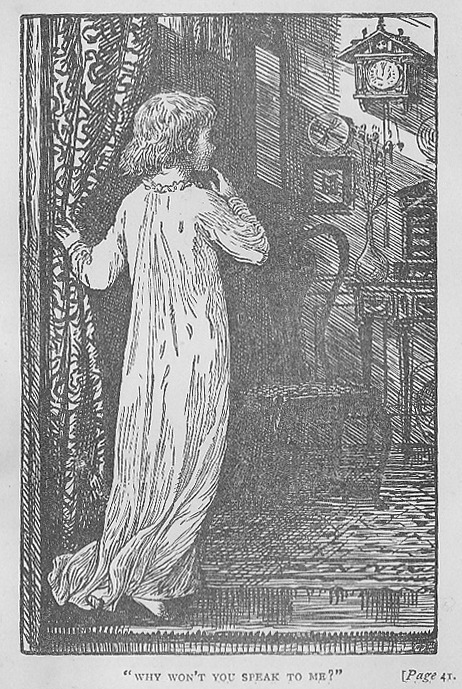 Griselda is shown a scene from a ball in the old house, where a young girl “was dancing with a gentleman whose eyes looked as if they saw no one else, and she herself seemed brimming over with youth and happiness”. But the next scene is of the girl’s funeral. The young gentleman paces beside her coffin, white with grief, and when Griselda questions her aunts about this scene, she learns that he dies soon after of a broken heart, and their baby son, her father, was sent to the aunts. Griselda herself has recently lost a mother: this is the reason why she has been sent to live with the aunts. Dead parents are, in fact, everywhere in these two texts. Sybilla is raised by her grandfather as her parents are dead, and Hugh is sent to live with Jeanne and her family following the death of his parents. Jeanne is the sole child in possession of a full set of parents, but even they have more than a suggestion of mortality about them; her father is much older than her mother and suffers rheumatism. 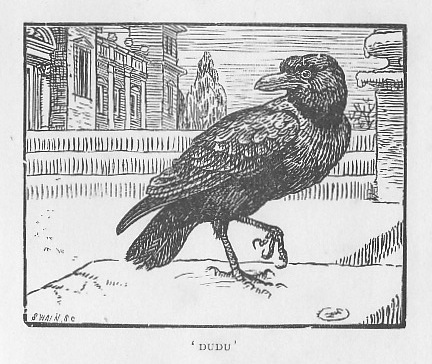 Dudu the raven tells Hugh and Jeanne the story of their ancestors just as the cuckoo shows Griselda hers, along the way remarking that he is somewhere in the region of three or four hundred years old, and again it is a story filled with dead parents and children. The cousins’ great-grandmother Jeanne and great-grand aunt befriend a little English girl while they are in their late teens. This girl has lost both her parents. She moves away and the young ladies marry, and do not meet with their English friend Charlotte until many years later, when the Revolution has broken up their family, and Charlotte is able to help Jeanne and her husband escape France. The friends meet up once more, many more years later when all three are old women. Charlotte’s and Jeanne’s husbands have both died as relatively young men; Charlotte has lost all her children and is herself on her way South to die in a temperate climate in the area where her baby daughter died. This sad history, and the history of Griselda’s family, makes clear the dangers of marriage and childbearing. 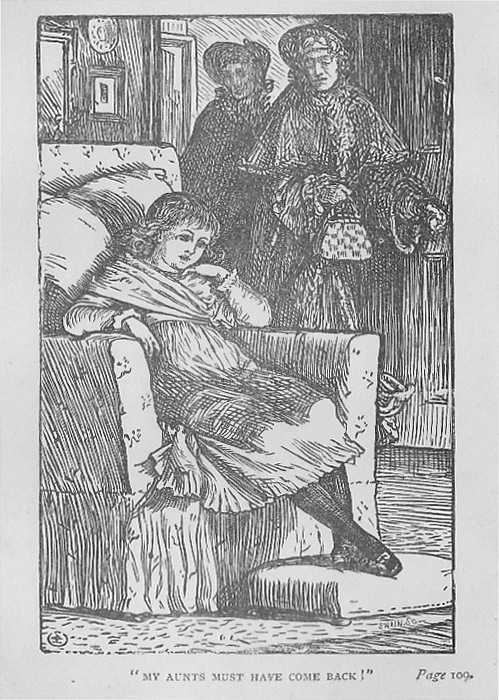 It is physically and emotionally damaging, and while this might be read as merely reflecting the realities of an age where death in childbirth and infant mortality was a very real possibility, Aunt Grizzel, at least, believes that these threats are ones that Griselda can be potentially sheltered from through limiting any real experience and interaction with “rude” boys. It is difficult, however, to read Aunt Grizzel’s desire to prevent or at least delay Griselda’s entry into an adult relationship as that of a radical woman who wishes her great niece free from the unequal power relations of sexual maturity. Griselda’s lesson, emphasized again and again, is to learn to obey, and to do her duty, and it is the successful mastery of this lesson which signals that the fantasy may leave off, and the process of forming real friendships with other real children may begin. Her name refers back to the “Patient Griselda” story, perhaps most well-known for its appearance in Boccaccio’s The Decameron, where a young wife uncomplainingly endures heartbreak, humiliation and rejection at the hands of her husband, who merely wishes to test her patience and sense of duty; having done so, he honours her as the ideal woman and all ends happily. It seems that The Cuckoo Clock highlights sexual relationships as a source of damage to women, but rather than propose a radical rejection of the role of wife and mother, Griselda must be sheltered for as long as possible in a state of innocence from what is ultimately inevitable. Her lesson of obedience enforces her position within the text and within the family structure as the newest element of a repetitive narrative. She will, one day, have to endure the deadly pains of childbirth just as her grandmother and her mother have. procession while their “children” walk behind them in obedient pairs. This behaviour is not, however, to be condoned in the “real” world, where the children instead play with dolls and make mud pies. The family history which Dudu tells them functions in the same way as the cuckoo’s dream sequence: it shows the disastrous and inevitable consequences of adulthood.Both texts appear to share on the one hand this belief that fantasy, as a separate world to which the child may journey through some dream-like state, should be a place where unsettling issues may be worked out, future roles tried on and impossible desires acted upon, but also where innocence is presumed. The return to the “real” is a return not only to an adult-regulated site where lessons learned may be demonstrated, but to a place where innocence cannot be taken for granted, where the children must actively perform as children in order to preserve their threatened childishness. The barrier between the two worlds is in this sense absolute, as the safety and inherent innocence of the fantasy world authorizes behaviours which are entirely inappropriate in the real, and the child’s return fixes this: “By placing the fantasy ‘outside’ or in the subconscious, such endings can support the stark rationalist oppositions of reality versus fantasy, adult versus child” (Honeyman(3)). But on the other hand, the narratives point to the impossibility of separating the two worlds, and by extension, of separating the fictional child from the adult. Instead of creating sealed off worlds in which Griselda, Jeanne and Hugh can safely play and express themselves, the adult, “real” world to which they belong seeps through into the fantasy, contaminating it with the same power relations the children are faced with in their daytime world. The cuckoo and Monsieur Dudu are for all practical purposes adults. Their relationship to their charges is that of adult to child: they order, teach, scold, and patronise, and they retain absolute control over what the children may and may not do, but they are more than just figures of control. Without the protection and knowledge of the cuckoo, Grizzel would be completely at a loss as to how to behave in the worlds she encounters. Without Dudu, Jeanne and Hugh would remain run aground in their boat, trapped in Tapestry Land. Both sets of children would know nothing of their family history. This need for an adult chaperone and guide shows that even in the spaces of fantasy, however distinct from the “real” world they appear to be, the child’s safety cannot be assured. Far from functioning as a place of anarchic freedom and adventure, the child’s experiences, no matter how wild and surreal, must be authorised and mediated by an adult cipher. Fantasy is not, in these texts, a “safe” place for children to be, any more than the “real” world is safe. The presence of the adult signifies that innocence cannot be presumed for either space and cannot be presumed for the child, but it also signifies the inability of the child as a fictional construction to exist free from the adult. 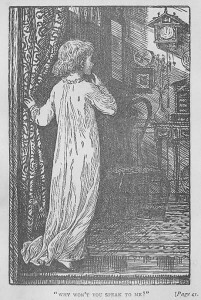 The return journey device foregrounds the same issue as the fictional child death: the paradox that while the child cannot be successfully imagined or written completely free from the authorial trace of the adult, this close proximity to the fictional child does not allow the adult better knowledge of a theoretical real child, but instead increases the distance between them. 1: For the following discussion of change, “seeming” and lack of change in The Cuckoo Clock I am indebted to Dr. Karin Lesnik-Oberstein and members of the Children’s Literature Master’s seminar at the University of Reading. 2: Thanks to my supervisor Harry Ricketts for pointing this out! Carroll, Lewis. Alice’s Adventures in Wonderland and Through the Looking Glass. (1865; 1871) London: Dean & Son, 1896. (1)Gilead, Sarah. “Magic Abjured: Closure in Children’s Fantasy Fiction.” PLMA 106.2 (1991): 277-293. JSTOR. 11 June 2008. <http://www.jstor.org>. (3)Honeyman, Susan E. “Childhood bound: In garden, maps, and pictures.” Mosaic. 34.2 (2001): 117-133. ProQuest.2 April 2008. http://proquest.umi.com.helicon.vuw.ac.nz>. 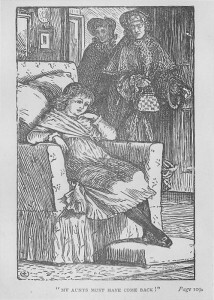 (2)Knoepflmacher, U. C. “Little Girls without Their Curls: Female Aggression in Victorian Children’s Literature.” Children’s Literature. 11 (1983): 14-31. Project Muse. 28 January 2009. <http://muse.jhu.edu/search>. Molesworth, Mrs. The Cuckoo Clock. (1877) Intr. Emma Chichester Clark. London: Jane Nissen Books, 2002. —. The Tapestry Room: a child’s romance. (1879) London: Tom Stacey, 1972.